The "no rules" challenge for this week is open, so be sure to get your entries uploaded and linked up! Holy smokes. If you're looking for technique inspiration, be sure to scroll down and look at the entries in the favorite technique challenge because they are incredible! So much talent, and so much crafty ideas and goodness shared. Thank you to each and every one of you who entered. 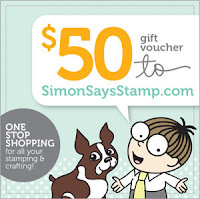 Also, many thanks to Simon Says Stamp for another great chance to win a $50 voucher!! Bond says....Congratulations ladies. Great job. WOW!!! Thanks SSS Peeps!!! Congrats to everyone! I was shocked and thrilled to see my name as the winner of "favorite technique." Thank you so much!